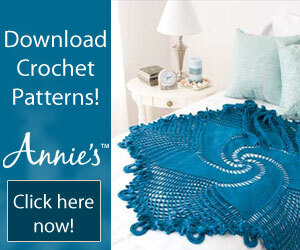 Super easy crochet afghan that can be used as a lap-ghan or foot blanket on your bed! 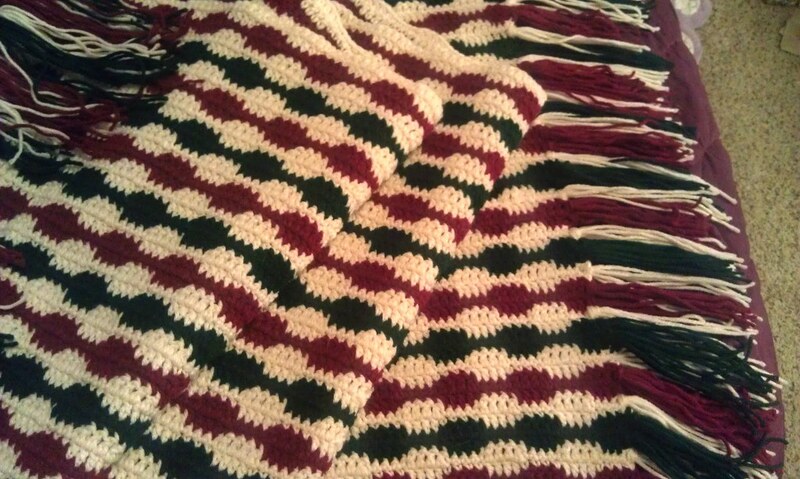 Rows of red, green and white in blocks of crochet stitches make this blanket eye-appealing. 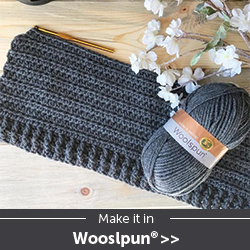 Simple double and single crochet stitches alternating like waves and done lengthwise instead of width-wise finished off with fringe adorning the ends of the crochet blanket. It was very easy to do and fun too! I really enjoyed making this crochet blanket, especially from a different direction. 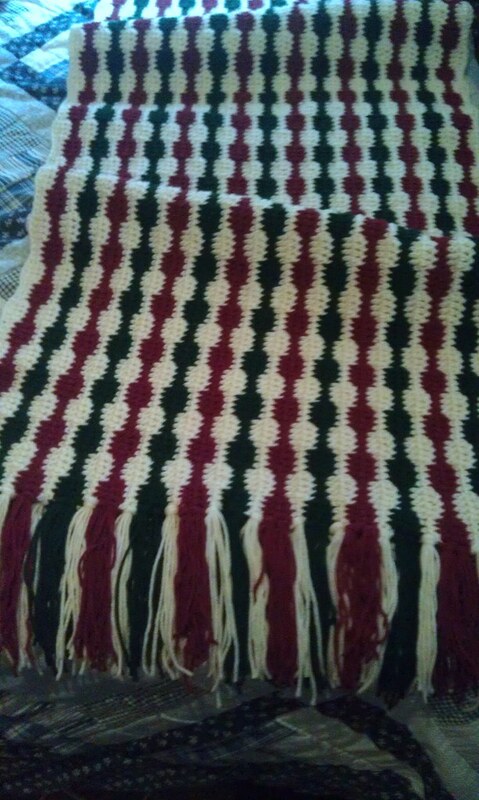 I'm used to making my blankets by width. Hope you like it too! Row 1: sk 2 ch, 1 sc in next 3 ch, *1 dc in ea of next 4 ch, 1 sc in ea of next 4 ch, repeat from * to end. Repeat rows 3 through 6 until desired width. 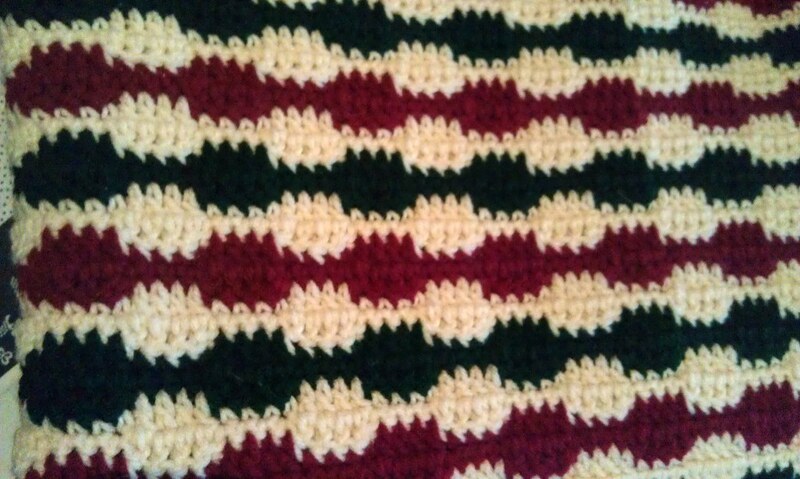 You will see the pattern unfold as you make the blanket. My fringe was 8" strands folded in half and I used the traditional method of tying them to the ends. Are you quite sure this counts as "easy"? It looks so complicated! And what does Sk mean when reading a pattern? Does it mean skip? Wow so much to learn I need to jump in and try or I will be a beginner forever! What are their actual name of colors did you use? Or is it just red, green and white? The pictures looks so nice and antique traditional Christmas colors look, not so bright/bold. I love it! Probably a no-brainer question but at the end of each row you say to "work last st into tch and change color". What does "tch" stand for? Love this pattern. Thank you for sharing. I have two questions about this pattern. As you change colors, do you make a knot and weave in the ends or did you make them part of the fringe? Also, you have two rows of each color, did you do fringe for each row? How many strands of yarn did you use for your fringe? I weave my ends into the stitches using a large embroidery (dull) needle. I made fringe for each row, so yes it was double on the ends. I think I measured out about 8-9" and folded them in half. The length is really a personal preference. This is such an easy pattern and I am doing it in cream,olive tan and rust. Not finished yet but it's coming along and is very pretty . Thanks for sharing, I'm having a great time with it,you can almost do it in the dark!